You are taking your family camping, but you just can not fit all your gear in the car. How can you maximise the gear that you can take? First off be realistic with what you need to take — after all, camping is about living outdoors for a while, not living it up in a 5-star hotel. See my my camping gear checklist for my view on the essentials for car-based camping. Next, when you purchase gear, make sure it is going to fit. The is no point in buying the super deluxe tent if it is so bulky that no matter how you try, it just will not fit in your car. Or purchasing a huge fridge, and then finding it takes up half the boot space! So now you have a practical amount of gear and it is not overly bulky. But you still want to take that one extra item from your camping kit and it just will not fit! There are many options on the market to organise camping gear in your car, including storage drawers, plastic crates and duffel bags. All have pros and cons. Storage drawers are great for keeping things organised in the back of your 4WD, particularly if your vehicle’s primary purpose is camping. Examples include Black Widow or Drifta. Storage drawers are generally bolted permanently into the back of your vehicle. Built-in storage drawers are pushed heavily by camping publications. If you are a single person or a couple with a whole car, to store your gear — and no kids and their additional gear — then storage drawers make a lot of sense. Space is probably not at a premium and camping out of the back of your 4WD is very convenient. You can organise your gear in the drawers and easily access it. Storage drawers have an inherent problem that if they are not packed to the brim, they waste a lot of space in the top part of each drawer that is empty. Storage drawers also have the problem that your camping gear goes where the car goes. What happens if one person is preparing dinner at the camp site and needs cooking utensils and food, while the other person takes the car to get a carton of milk for breakfast? When you get home from your camping trip, you need to individually unpack each drawer, or alternatively leave all the gear in the vehicle for the next trip. Plastic crates are sometimes considered the poor man’s storage drawers. For a family camping trip, they have several advantages over storage drawers. Plastic crates are not permanently mounted in the vehicle, meaning that when the vehicle is not being used for camping, it can be returned to its original state. This is good if your car is used as a school bus or shopping trolley during the week. At the camp ground, plastic crates can also easily be removed from the vehicle. 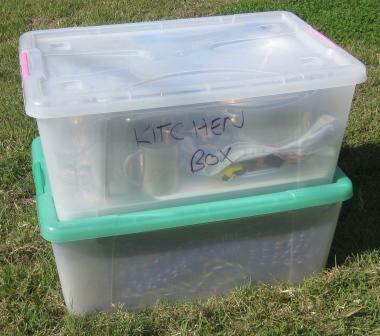 For example you may want to take your kitchen and food boxes out of the vehicle and place them under the table for convenience while cooking. Plastic tubs have many advantages over storage drawers, but also have similar disadvantages in that the empty space at the top and sides of the boxes is wasted space. A big problem with plastic crates is finding some of different sizes that are also stackable to minimise wasted space in the boot of your car. They also need to be strong enough to withstand the rigours of camping. Most plastic crates will crack under rugged outdoors use. I never did find some that met all these requirements and so settled for cheap plastic crates that I could afford to throw away when they broke — at least I could buy them in convenient sizes and they were stackable. I used to find that plastic tubs around 35 litres were a handy size to pack my camping gear in. They were large enough to be useful, but not so large that they would take up too much room in my 4WD or be too heavy to lift. Crates such as those from Bunnings, KMart or Big W are generally too flimsy, but are cheap, readily available and come in a variety of sizes. If you want a rugged plastic crate, consider the tubs from Nally — you will probably need to buy them from an industrial storage supplier, but some camping stores carry them. Nally crates are are tough, but their sizes did not suit my vehicle. If you want to absolutely maximise what you can fit in the back of your 4WD, consider using soft storage bags. Canvas duffel bags will compress, minimising the wasted space in the back of your vehicle. You can also easily remove them to return the vehicle to original condition or for convenience at the camp site. Using soft canvas bags is my personal favourite option at the moment. 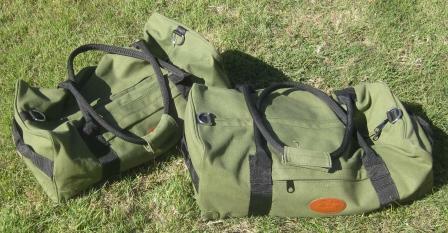 I am using Onland bags, which are tough canvas and come in four sizes. I use a separate bag for our kitchen gear, food, parts and clean-up, and even one for our 4WD recovery kit. Onland bags are so tough, I even use one on my roof rack to carry our camping chairs! Onland bags also have a zip ocket on the outside of each bag and a small, hidden zip pocket inside which is useful for storing your keys. You do need to consider how you pack the bags. For example, all my clean up fluids — such as spray-and-wipe and washing-up detergent — are stored in a plastic tub that I use for washing up inside a bag. If they fluids leak, they will be contained within the washing-up tub. Likewise, your food bag needs to go on top of the pile so that your food does not get crushed in transit. Label each bag clearly so that you easily know what is in each. For family camping, where space in the vehicle is at an absolute premium, an organised system of canvas duffel bags can not be beaten. Great write-up. I’m in the process of sourcing some duffel bags for clothes, But I hadn’t thought of using them for other camping gear. We use plastic boxes for gear too, and my wife makes sure there is no room left in any of them.